"Be Right Back" is a phrase, generally used in chatting on social networking sites like Facebook, Yahoo Messenger, Gmail etc. It is used to specify a situation on the online chat, when a person wants to tell the other person that "I will return to this conversation shortly". So, it is commonly used by an internet user to show that he or she expects to be away from his or her computer for a short time. It is also a way to show courtesy so that the other user does not wonder why a person is not replying anything for a while. This type of situation frequently comes in online chatting. 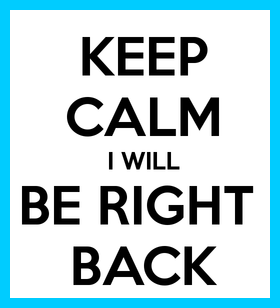 Now a day acronyms are very popular in online chatting, so the users generally use BRB instead of Be Right back.